I’ve been making these meatballs for as long as I can remember, but this is the first time I’ve written the recipe down, making them official! I usually use all beef in my meatballs, but occasionally I will add some pork. Feel free to use whatever meat combo you like to use. I really like to use buttermilk in my meatballs as it has more flavor than regular milk and it helps to tenderize the meatballs. I like to chop the onion, garlic and parsley very fine, my daughters are not big fans of chunks of onions in their meatballs. Sometimes, I use my chopper to almost puree the onions, parsley and garlic, so the meatballs get all the flavor and moisture from the aromatics, but no one can detect any chunks! Recently, I have been experimenting with grinding my own beef when I make meatballs, meatloaf or burgers! Who knew it was so easy! I buy a chuck roast and trim it down into pieces that I can use in my KitchenAid Food Grinder. Then in just a few minutes, I have freshly ground beef. You can also grind some of the other ingredients along with the beef such as the onion, garlic and parsley which is a real timesaver! I was skeptical at first that it would really make a difference in flavor, but I so wrong! It really tastes so fresh! Check out my video below, I’ll show you how to assemble and use the KitchenAid Food Grinder Attachment to grind beef and make my meatball recipe. 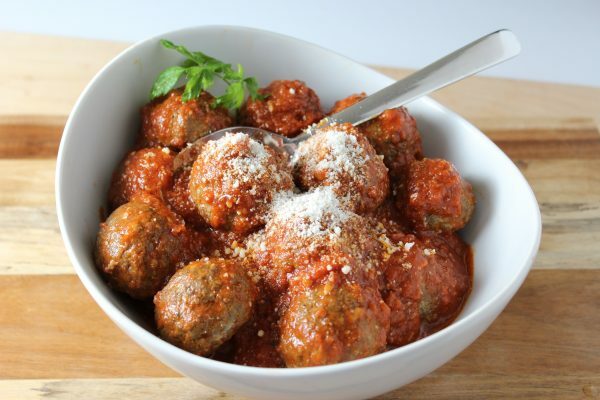 Italian Style Meatballs that are quick and easy to make! You can use ground beef from the market or check out my video and instructions for grinding your own beef! Preheat oven to 400 degrees and line a rimmed baking sheet with parchment paper or spray with non-stick baking spray. Whisk together liquid mixture ingredients in a liquid measuring cup. (To grind your own beef, see instructions below.) To use pre-ground beef: Combine all ground beef mixture ingredients in large bowl and mix gently until partially combined. ( I use my stand mixer with the flat beater on stir speed.) Then add your liquid ingredients and mix again until just fully combined. Don't overmix. Lay beef pieces out on parchment lined tray that will fit in your freezer. Freeze for 20 minutes. I used the KitchenAid Food Grinder Attachment with the finer grinding plate. I set my mixer to speed 4. Add pieces of beef one at a time to grinder, alternating with bread, onion, Parmesan, parsley and garlic. Place your ground beef mixture in your stand mixer bowl and attach the flat beater. Add your liquid ingredients to the bowl. Mix on stir speed until just combined. Let mixture rest for 5 minutes, so the bread particles can absorb the liquid. Mix again just for a few turns. Portion and roll your meatballs. I use a 1/4 cup or 2-ounce scoop for mine. Place on prepared baking sheet, leaving 2" between them. Bake for 15-20 minutes or until cooked through. If I am transferring them to a pot of marinara sauce, I will only cook them until they are browned on the outside as they will cook the rest of the way in the sauce. They can be made ahead and refrigerated for 3 days or frozen for up to 6 months. Sometimes I'll freeze them on a baking tray and then transfer to a zip top bag. This way they're not frozen and stuck together - you can take out a few at a time. Sometimes I freeze them in the marinara sauce. This recipe multiplies easily and they are great for simmering in marinara sauce in your slow cooker for a large crowd! I hear you EJ – We do have a lighter Artisan 3.5 quart mixer if that is of interest. It’s 25% lighter than classic tilt head model. 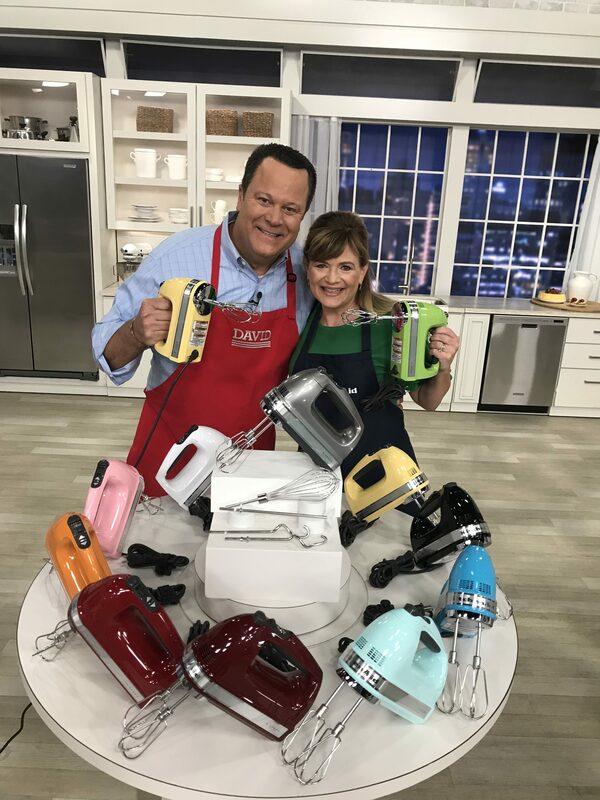 I’ve also heard from folks who keep their mixer on a cart, so they can wheel it in and out of the kitchen when they want to use it… Take Care!! Thats a great idea to put it on a cart.